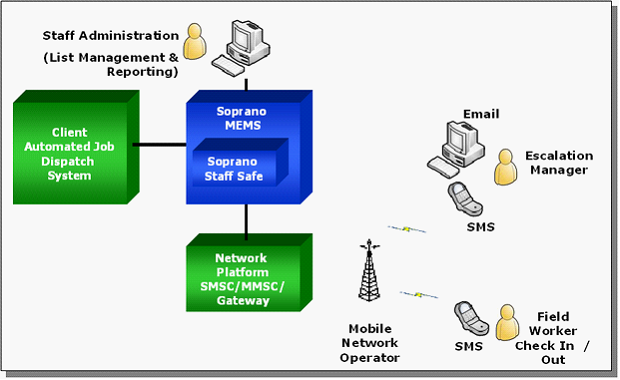 SOPRANO MEMS StaffSafe enables clients to harness the power of SMS to significantly and efficiently enhance the security of staff working in the field. Mobility within the workforce is a growing trend with an increasing number of staff working outside a fixed office location. There is a heightened safety risk for staff that work alone or in remote areas, travel long distances, visit client homes or have physically demanding jobs. •Integration into existing work force management systems for job dispatch. • Detailed reporting, e.g. by staff member and job identifier. •Scheduled safety checks ensure faster management response for staff who are injured, unable to respond or in danger, or required assistance.